Planning is underway to build a new water treatment plant to replace the aging Huia water treatment plant that was built in 1928 and two reservoirs on land either side of Woodlands Park Road, adjacent to the current plant. We are preparing material in preparation for lodging a resource consent application with Auckland Council early in 2019 for the necessary activities to form the building platforms for the proposed plant and reservoirs. The applications seek consent to carry out earthworks, remove vegetation and divert a stream. Find out more about the resource consent application for the replacement water treatment plant. Over the past year, Watercare has undertaken extensive studies on the two adjacent sites. The most comprehensive and scrutinised of these have focused on the sites ecology and vegetation cover. The findings of these studies have been mapped and combined with the sites physical constraints to determine the areas that will be least affected by the construction of the facilities. The proposed facilities have been designed to fit within these areas. The studies have been undertaken in close consultation with the Huia WTP Community Liaison Group (CLG), set up in 2017. The group is made up of members from local community groups and meets regularly to discuss community and ecological aspects of the project, as plans develop. As part of our on-going investigations into the proposed WTP and reservoirs, we have commissioned a further report on the proposed reservoirs, which is due in early 2019. 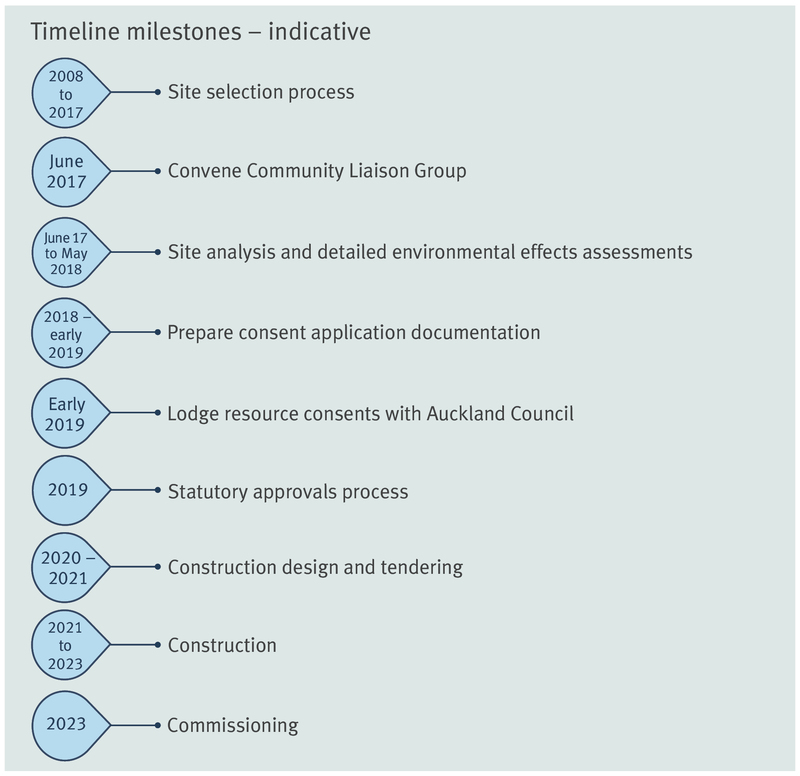 We have therefore decided to defer lodgement of the resource consent application until early 2019, when more information will be made available. The replacement treatment plant will help to maintain the security and resilience of Auckland’s water supply. The current plant supplies about 20 per cent of Auckland’s total water supply and replacing the 100-year-old plant is essential to ensuring Aucklanders continue to have access to high-quality, reliable water services into the future. During the Tasman Tempest weather event in early March 2017, extreme rainfall in the Hūnua Ranges resulted in slips and sedimentation in some of the supply dams and the shut-down of the Admore plant. The reliance on the Huia Water Treatment Plant during this extreme weather event was essential to continuing to supply water to the Auckland area. Built in 1928, the Huia water treatment plant, in Woodlands Park Road, is nearing the end of its useful life. Watercare will ask that the Auckland Council to publicly notify the resource consent applications. This should be in the middle of the year. The notification of the application will give everyone the opportunity to make a submission on the proposal. The Auckland Council is likely to advertise the application in the local newspapers and directly affected parties will be served notices individually. Public submissions will be heard by independent commissioners at a set hearing following the end of the submission period. We will post the resource consent application and documentation on this website when it is available. The consent documents will follow lodging of the consent application with Auckland Council. Find out more about the resource consent application process for the replacement water treatment plant. Background documentation for the site selection for the replacement water treatment plant.